Create a plane from Create > Geometry > Plane. Use Height: 100 and Width: 100. 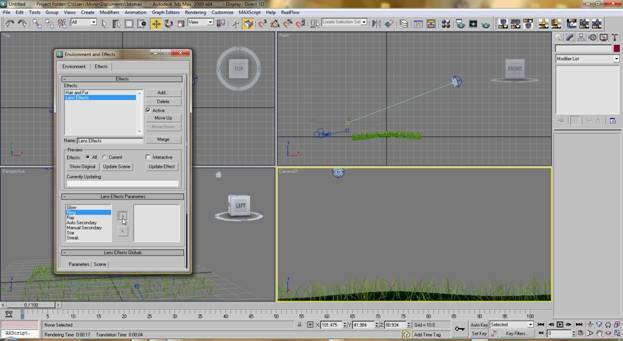 Then add a Noise modifier to the plane. Select the plane and go to Modify panel and select Noise. Use Seed: 2; Scale: 70 and on the strength, Z: 15. 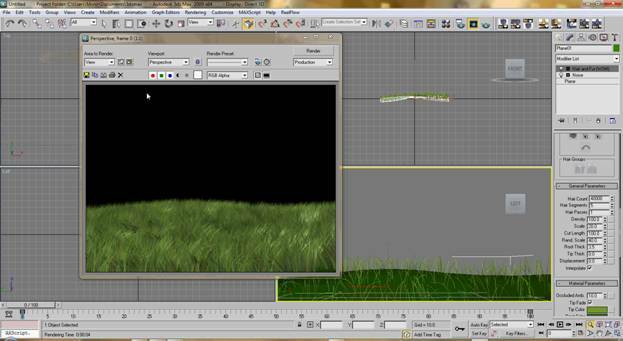 Now apply Hair and Fur modifier on it. Use my values. Hair Count: 30000; Scale: 20; Root thick: 3.5. Keep the other values unchanged. On the material parameters rollout, Use Occluded Amb. : 10; Tip color: 115,115,45(r,g,b); Root Color: 79,102,45(r,g,b); Hue Variation: 30; Specular: 40; Glossiness: 90 and keep all other values unchanged. 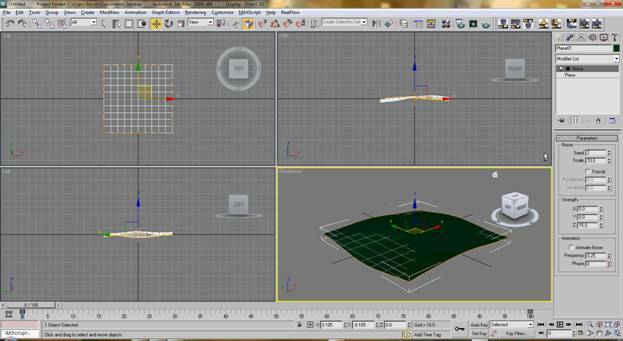 Now use Orbit, Zoom, hand etc tools to get a perfect view on the Perspective viewport. Once you get a perfect view, press Ctrl+C to create a camera from that view. Now go to Rendering > Render Setup. 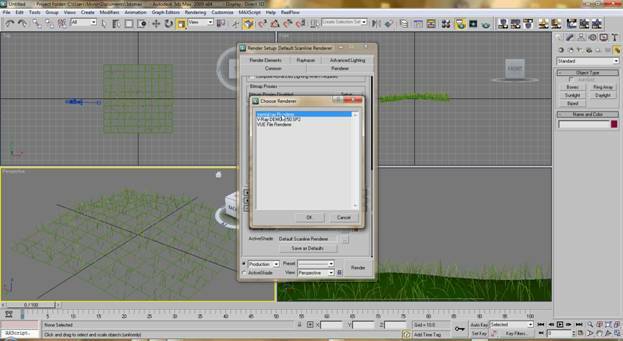 On the Assign renderer rollout, click on the button next to the Production and choose Mental Ray renderer. Now we’ll create the sun and the sky. Go to Create > Light > Daylight System or on the Create panel go to system and choose daylight. 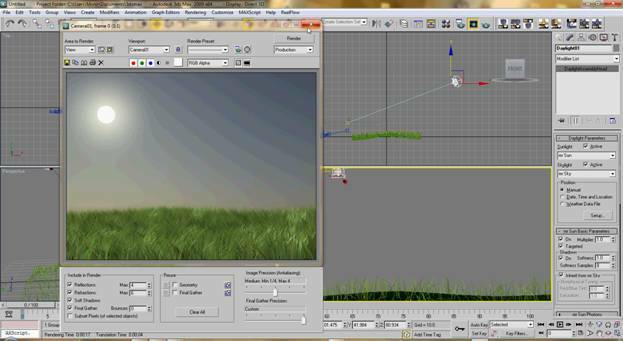 A dialogue box will appear, select yes to apply a physical sky environment. Make the compass of the daylight where the camera target is. Now on the modify panel find Position option and choose Manual. Now you can drag the sunlight using move tool. 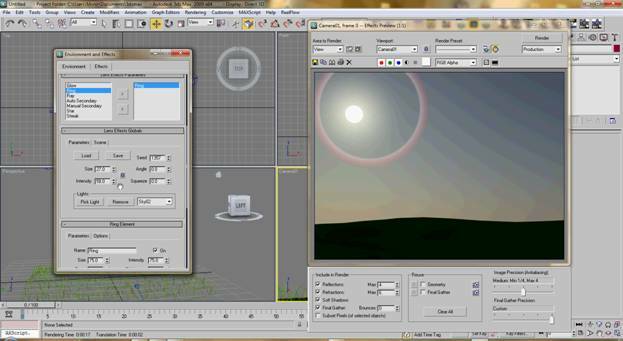 Drag the sun to a position that matches the camera view angle and get a nice position to render. 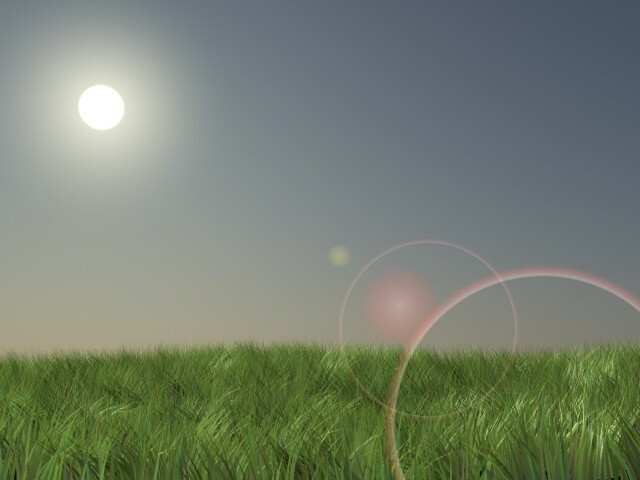 To position the sun correctly, you have to make render several times. On the sunlight, choose mr Sun and Skylight, choose mr Sky then a dialogue box will appear. Press yes to apply mental ray physical sky environment. Now go to Rendering > Effects. On the effects, click Add and choose Lens Effects. On the Lens Effects parameters rollout, select Ring and click add(>) button. Now on the Lens Effect Globals rollout, use Size: 27; Intensity: 58. 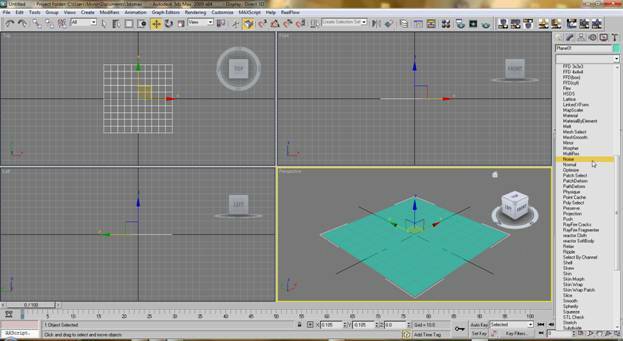 Click Pick light and select the sunlight from the viewport. Now on the Ring Element rollout, change Size: 90; Intensity: 75; Plane: 780; Thickness: 10 and have other values unchanged. Now add 3 more Rings and only change the values on Ring Element rollout, for first one Size: 30; Intensity: 35; Plane: 500; Thickness: 2. Second one, Size: 1; Intensity: 75; Plane: 450; Thickness: 20. And the last one, Size: 0; Intensity: 75; Plane: 345; Thickness: 10. Also for this one, select the red color on Radial Color and change it to yellow color. 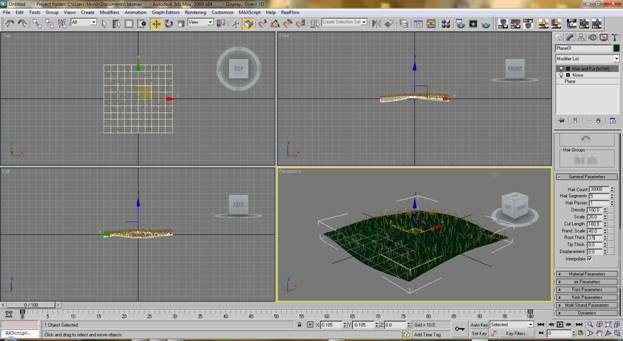 Now Render the scene and see the Final Result. As you can see the results of the render are very realistic, and just shows what can be done in a few simple steps you have learned in this tutorial. Check more tutorials below, and please share this tutorial with your friends. Thank you.